In BEFORE DAWN, Kate, 17, hates her life. An outcast in her own family, who doesn’t understand her, she is hated by her more popular and beautiful sister, and despised by her controlling mother, who favors her sister over her. Kate’s only solace is her friends and her smarts. But even with that, her life seems destined for a dead-end—especially when her mother announces she will have to stay back from college to pay for her sister’s tuition. But one day, all that changes. On her 17th birthday, one of the popular boys falls for her. At the same time, a mysterious new boy, Elijah, arrives at her school, and their connection is undeniable. All seems to be turning her way—when a terrible accident turns her life upside down. Kate is supposed to die. But on the verge of death, something happens, something which keeps her alive, which transforms her into something she was never meant to be. 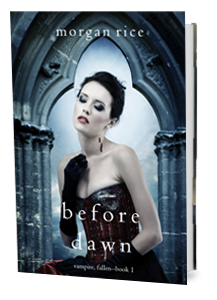 In the twilight between life and death, Kate becomes something no one has ever been before. The debut of a spectacular new series rife with love, loss, heartbreak and redemption, BEFORE DAWN offers a fresh take on the vampire genre. With its heart-pounding suspense and characters you will fall in love with, it will keep you reading late into the night and make you fall in love with fantasy all over again. Also available is Morgan Rice’s 12 book series THE VAMPIRE JOURNALS, which begins with TURNED (Book #1), a #1 bestseller with over 900 five star reviews on Amazon—and a FREE download!